Butterflies always seem to be the flavour of the month, especially where the young and young at heart are concerned. Imagine walking down your street and seeing big beautiful green and black butterflies. Once, early residents of southeast Queensland and northern New South Wales could do just that. 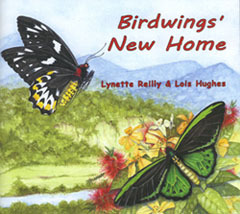 Local Runaway Bay resident Lynette Reilly is passionate about butterflies, in particular the beautiful and endangered Richmond Birdwing butterflies. Lynette is not your traditional greenie. Formerly a biology teacher at Keebra Park High School, she is now a writer with an intense desire to highlight the intriguing small creatures in our natural world. This new picture book is her second. The beach in front of her home inspired her to feature soldier crabs in her first children’s book Micky’s Music which was published by Greater Glider in 1998. ‘I’m also very conscious of the trauma that people go through when they move house,’ Lynette says. ‘So many young families are relocating these days, especially here on the Coast. Lots of children can relate to the butterflies asking Where will we sleep tonight? and Who will I play with? As a young child, I moved house in various country towns, but we always came to the Coast for holidays. Our children and grandchildren have survived moving too. ‘Putting butterflies and the search for a new home together seemed natural,’ she adds. The Friends also pay tribute to the Jupiters Casino Community Benefit Fund whose grant covered the printing costs for the book. 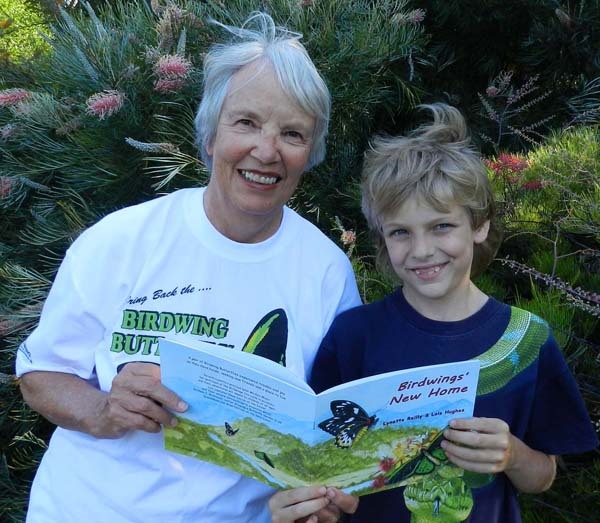 This enables all proceeds from book sales to benefit the Gardens and the Richmond Birdwing Conservation Network.